It was the kind of night country music fans dream of. Hitmaker Jason Aldean stood on stage, his tan cowboy hat tipped forward, as he belted out the opening lyrics to his chart-topping song “When She Says Baby.” He was the closing act of the Route 91 Harvest Festival in Las Vegas last fall. The desert sky was dark except for the iridescent glow of the Strip. In the audience, more than 20,000 people watched, cheered, sang along—locals, tourists, teens, families and friends savoring the music, the setting and that freeing feeling of watching a legend perform under the stars. Suddenly, loud, sharp pops erupted. Aldean bolted off stage. Then bloodied bodies started collapsing. 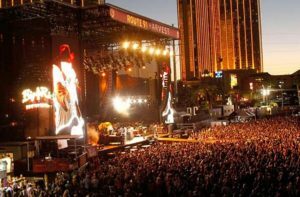 A lone gunman, perched on the 32nd floor of the nearby Mandalay Bay and Casino, unleashed a barrage of gunfire on the unwitting concertgoers. Panic and confusion ripped through the crowd as people fled the semi-caged, alcohol-fueled venue, ducking for cover, jumping over fences and running for their lives, never really sure which way to go. The shooting on October 1, 2017, was one of the largest unanticipated gunfire disasters in American history. Thirty-one people died at the scene, another 27 were pronounced dead at local hospitals, and over 700 were injured. Tens of thousands more were left psychologically scarred. And these statistics only account for the people who attended the festival that night. What about the taxi and Uber drivers who rushed victims to hospitals? The nurses and doctors who tended to them? The hordes of tourists roaming the Strip that night? The journalists covering the story for weeks and months to come? People watching the news unfold from afar, wondering if their loved ones were still alive? Unthinkable events like the Las Vegas shooting are known as “critical incidents”—acts of nature, mistakes of humankind or deliberate acts of evil involving injury, loss, conflict and trauma. Their consequences resonate far beyond the scene, affecting everyone from victims’ families, to witnesses and first responders, to the communities where the incidents took place. Some critical incidents bring people together and others tear us apart. Some have consequences for years, others generations. All of them require our collective attention to better understand how they happened, their impact on people and communities, and what can be learned for the future. In May 2018, a group of survivors, first responders, psychiatrists, journalists and security specialists gathered in Las Vegas to study the aftermath of the Route 91 shooting. This rare mix of experts came together to understand how the shooting happen; why the festival was such a vulnerable target; survival and survivors; medical responses to large-scale assaults, and journalists’ roles in covering the story. The three-day conference—organized by the Academy for Critical Incident Analysis (ACIA) at John Jay College of Criminal Justice—offered ringside seats to an historic conversation on the impact of the tragedy. ACIA is dedicated to scholarly research on the emergence, management and consequences of critical incidents, and has conducted case studies following the September 11 attacks in 2001, Hurricane Katrina in 2005, the Virginia Tech shooting in 2007 and the Norway massacre in 2011, all with the goal of ensuring that these tragedies become turning points rather than footnotes to history. This report is based on notes and transcriptions from the conference as well as follow-up conversations. Some quotes have been edited for clarity and length.